Director – Peter Sohn, Screenplay – Meg LaFauve, Story – Erik Benson, Meg LeFauve, Kelsey Mann, Bob Peterson & Pete Sohn, Producer – Denise Ream, Music – Jeff Danna & Mychael Danna, Animation Director – Sanjay Bakshi, Effects Supervisor – Joe Reisch, Production Design – Harley Jessup. Production Company – Pixar Animation Studios. In an alternate timeline where the meteor that killed the dinosaurs off did not strike, they have grown up as intelligent beings, able to speak and having created a rudimentary civilisation. Arlo is the runt of a litter of three dinosaur children. He grows up on a farm on Clawtooth Mountain, watching as his brother Buck and sister Libby are allowed to place their marks of accomplishment on the side of the granary but feeling inadequate that he has done nothing to match them. His father tries to take Arlo out into the wild to teach him to conquer his fears but is swept away as the river floods, not before he throws Arlo to safety. Arlo’s mother struggles to harvest the crop on her own. Arlo then discovers a young human child in the granary and chases it off, only for both of them to fall into the river and be washed away. Lost in the wilderness, Arlo tries to make it back to Clawtooth Mountain and finds that he is forced to rely on the young human boy. Naming him Spot, a slow friendship grows between the two during the journey. The Good Dinosaur was the sixteenth animated film from Pixar, following such hits as Toy Story (1995), A Bug’s Life (1998), Monsters, Inc. (2001), Finding Nemo (2003), The Incredibles (2004), Cars (2006), Ratatouille (2007), Wall-E (2008), Up (2009), Brave (2012), Inside Out (2015) and Coco (2017), as well as sequels to many of these. Pixar films can largely be divided into two different groupings – those that came up to the point where the studio went into hardball negotiations with Disney over control of copyright on their characters and the right to make sequels and those that came after they regained that control. The demarcation line comes around Toy Story 3 (2010). After this point, Pixar’s quality goes from producing works that were at their absolute peak such as Wall-E and Up to those that far more weakly sit rehashing their past successes with the likes of Cars 2 (2011), Monsters University (2013), Cars 3 (2017 and Incredibles 2 (2018). Their negotiations with Disney also seemed to give various of the creative talents big heads only for this to blow-out with expensive box-office flops such as Andrew Stanton’s John Carter (2012) and Brad Bird’s Tomorrowland (2015). Whereas before the demarcation line, the studio was producing one original animated film per year with usually rapturous critical and box-office results, their output of original films after that seemed stretched – a four-year gap between Up and the mixed Brave and a further three years to Inside Out and The Good Dinosaur. Certainly, these latter two seem to be reaching back to the Pixar glory days and regaining some ground, if not with complete one hundred percent success. There have been various animated films about talking dinosaurs before. The first of these was Don Bluth’s The Land Before Time (1988), which led to an amazing twelve sequels. Disney made Dinosaur (2000) following various species as they relocate following a meteor strike, and there was also the terrible Walking with Dinosaurs (2013). Somewhere in there is also the Steven Spielberg-produced flop We’re Back: A Dinosaur’s Story (1993), a conceptually bizarre film about dinosaurs brought through time into the present-day and their intelligence enhanced. Beyond that and a few epochs up the line, prehistory has proven a popular venue for animation with Ice Age (2002), which is now heading towards its fourth sequel, and The Croods (2013). Somewhere in there you could probably also throw tv’s The Flintstones (1960-6), although that was more of a contemporary situation comedy played out with prehistoric equivalents. As both the interminable and near interchangeable The Land Before Time and Ice Age sequels have readily demonstrated, prehistory offers very limited plot options – especially given that the characters are animals in the wild and without much in the way of civilised amenities surrounding them. Most of the abovelisted films have centred around plots involving either the animals forced to relocate after a natural disaster or becoming separated from the rest of the herd. The Good Dinosaur is no different to these others and opts for the dependable plot of the lost creature undergoing a bildungsroman as it makes its way back home. You also feel that much of the initial scenes have been drawn from The Lion King (1994) – the father killed by an oncoming wave (a stampede there, a flood here) and the young son abruptly ejected out into the wilderness. 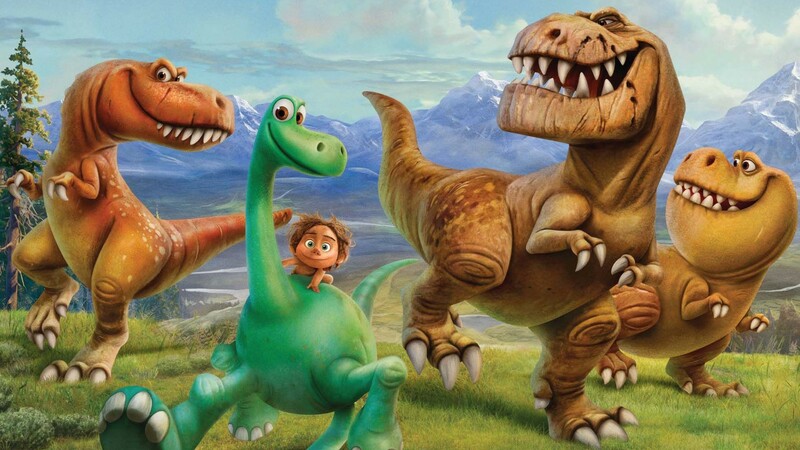 The surprise about The Good Dinosaur is that it is actually an alternate history story. This is signified in the first few moments when we see the film’s Jonbar Hinge point where the asteroid that killed the dinosaurs misses the Earth (even if the scientific nitpicker in one kept objecting that the asteroid belt we see is so close together that you could hop from one to another in micro-gravity whereas in astronomical reality asteroids are so far apart you couldn’t even see the nearest one with the naked eye). From there we jump forward a few million years to where dinosaurs have evolved to be able to talk and have created a rudimentary civilisation (although the stickler in me also kept wondering how dinosaurs that have no manipulative digits are able to weave ropes and build fences) and we see the beginnings of mammalian life emerging – cavemen that have not yet learned to walk upright, bison and several small furry animals. The alternate history is a high concept notion, which makes it all the more surprising to see in a family film like this. The world of evolved dinosaurs has been done before, most notably with Harry Harrison’s West of Eden trilogy and on film with Super Mario Bros. (1993) and the tv mini-series Dinotopia (2003). The essence of The Good Dinosaur is essentially the same one as a man/boy and his dog tale that we get in a whole genus of films that go back to Lassie Come Home (1943) and Old Yeller (1957), although here the relationship is oddly between a dinosaur and a Cro-Magnon boy who fulfil roles that in a live-action film would respectively be played by a teenage boy and a dog – the caveboy even gets nicknamed Spot. This works rather appealingly and there is a good deal of cuteness and humour in the friendship that grows between the two of them. Indeed, the scene where the two mime out in the dirt the notion of family and then bond over the loss of a parent and the subsequent scene at the end where the two part will leave few dry eyes in the house – the first Pixar film since Up that you can say successfully touches the tear ducts in that way. 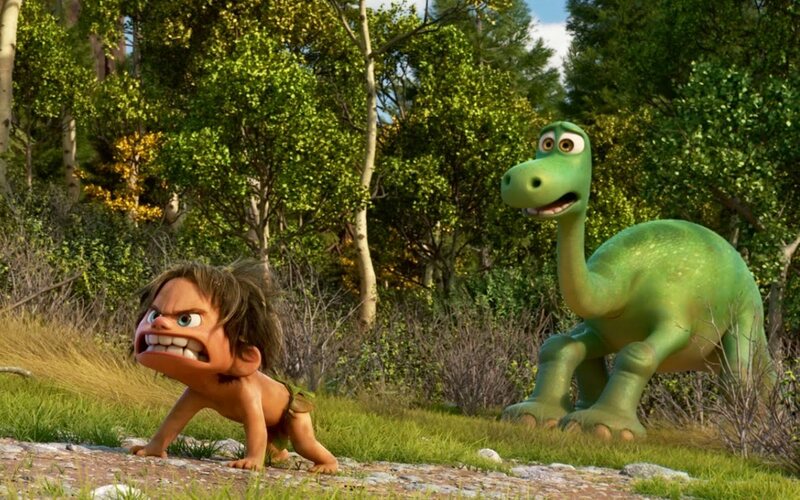 The Good Dinosaur is not perfect. Peter Sohn is a newcomer director and while he does extremely well when it comes to the emotion side of the equation, he doesn’t quite yet hit the other highs in terms of warm and enjoyable humour. Some of the supporting characters seem slightly off – in particular, the head-scratching character of a styracosaurus (voiced by Peter Sohn himself) and a psychotic pack of pterodactyls. It is not quite sure what the intent was here but the net result is characters that seem off-puttingly weird, if not somewhat scary. More successful are the scenes where Arlo and Spot encounter the family of friendly tyrannosaurs but did Sohn really need to consciously mimic Western campfire and round-up scenes during these sections?